Today you save per room €34.00. This way your flight to Crete will be even cheaper! Today you save per room €32.00. This way your flight to Crete will be even cheaper! For families with two children we provide comfortable family rooms as well. They contain a double bed and two single beds (not travel cots) either on two levels or at the same level. The family rooms in Corissia Beach Hotel are located in several surrounding buildings, only 1-2 minutes walk from the sandy beach of Georgioupolis. 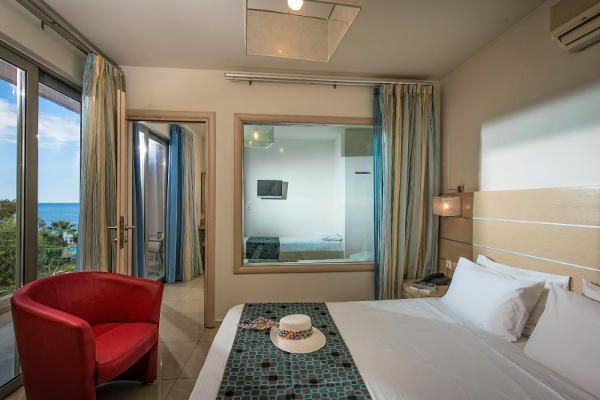 The room also offers a balcony with sea or garden views, air conditioning, bathroom/WC with hair dryer, a small refrigerator, Tv with satellite channels, free WiFi, telephone and safe.